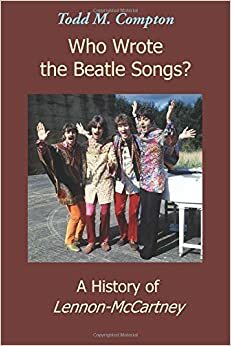 Who Wrote the Beatle Songs: A History of Lennon-McCartney is a book in the tradition of Mark Lewisohn’s The Beatles Recording Sessions, Walter Everett’s The Beatles as Musicians, Ian MacDonald’s Revolution in the Head, and Tim Riley’s Tell Me Why —it surveys all of the songs by the Beatles. However, unlike those books, Who Wrote the Beatle Songs concentrates solely on songwriting. It also has a strong biographical element: I tell the fascinating story of John Lennon and Paul McCartney as songwriters. The Beatles are arguably the most influential group in the history of popular music, and the single most important element in their success was their songwriting. Unlike rock stars such as Elvis, Jimi Hendrix and Eric Clapton, they were songwriters first and performers second. They have been widely misunderstood because the history of their songwriting has not been examined carefully. Setting aside the songs of Harrison and Starr at this time, all their songs were attributed to “Lennon-McCartney,” which suggests 50-50 songwriting ownership, in the tradition of George and Ira Gershwin. In fact, most of the Beatle songs were dominated by Paul or by John, and some were written entirely by one or the other (such as John’s “Across the Universe” or Paul’s “Hey Jude”). After the Beatles breakup, Lennon and McCartney have given a number of interviews discussing who wrote which Beatle songs. Unfortunately, these interviews are often contradictory, a natural result of trying to remember events that took place many years (sometimes decades) earlier. John had a tendency to emphasize individual authorship in his interviews, while Paul frequently remembered collaboration (though often “finishing” collaboration, after one writer had substantially begun the song). To evaluate such complex, contradictory evidence, I’ve tried to use standard historical tools to come to a valid judgment on who wrote each Beatle song. The result is the first comprehensive, detailed assessment of who wrote the Beatle songs. Every chapter is devoted to a Beatles album, and its attendant singles. I give a careful attribution for every song and tell the story of how it was written. Then I evaluate conflicts or unities in the evidence. So this book is full of great stories—how John wrote “She Said She Said” after he heard Peter Fonda tell of a near-death experience at a party with the Byrds in L.A.; how Paul wrote “Yesterday” in his sleep, then sang it for months with the lyrics “Scrambled eggs—Oh baby, how I love your legs”; how George’s mother, Louise French Harrison, filled in a gap in “Piggies” with “What they need’s a damn good whacking!”. When this survey is complete, we can draw conclusions about the individual songwriting talents of Paul, John and George, and can reject many widespread stereotypes about them. One cliché is that John specialized in rock while Paul produced ballads. Actually, both of them wrote strong rock songs (like Paul’s “Helter Skelter”) and strong quiet songs (like John’s “Goodnight”). Another common misapprehension is that the Beatles’ best songs were based on close collaboration; actually, as these two songwriters progressed in maturity they wrote together less. Paradoxically, the songwriting flourished as the collaboration decreased. John became increasingly interested in lyrics, while Paul was always obsessively devoted to music (though they both wrote great music and lyrics at times). Who Wrote the Beatle Songs will celebrate and give a wealth of insight into the idiosyncratic brilliance of both of the Beatles’ two main songwriters.